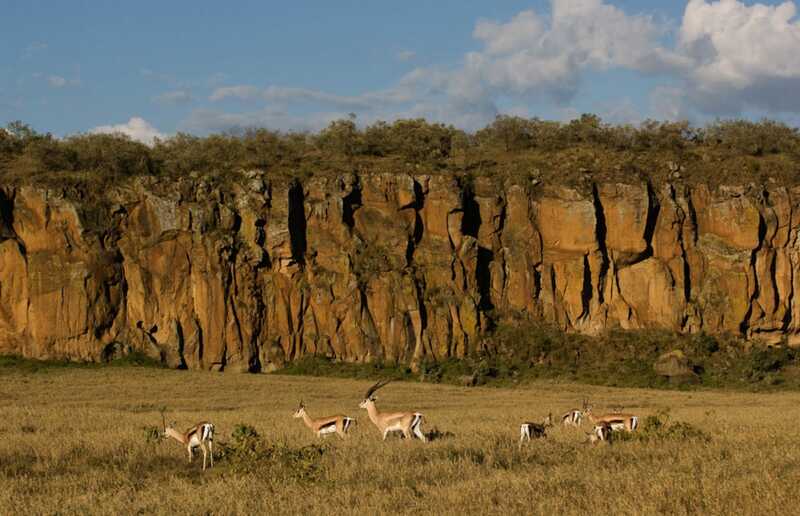 The sheer basaltic cliffs of the Rift Valley northwest of Nairobi hem in a classic East African landscape of open savannah studded with jagged volcanic outcrops and strung with beautiful lakes. Large mammals are less prolific than in the likes of the Masai Mara or Amboseli, but the area is renowned for its prolific birdlife. The main attention-grabbers are the million-strong flocks of flamingos that frequently amass at saline lakes Nakuru and Bogoria. Then again, the freshwater lakes Naivasha and Baringo vie with each other for the accolade of ‘top general birding hotspot outside the natinal park system’. In addition, Lake Nakuru National Park is one of the best places in East Africa to look for both black and white rhino, while the likes of Crescent Island, Hell’s Gate National Park and Green Crater Lake Sanctuary offers great opportunities to see large wildlife on foot. Fringed by fever-tree forests and low mountains, freshwater Lake Naivasha, only 90 km northwest of Nairobi, provides a superb ornithological primer for East Africa (resident birders talk glibly of ticking off 100 species before breakfast). The shallows host large numbers of hippo, while Crescent Island offers the opportunity to walk amongst giraffe, buffalo and waterbuck. A popular afternoon treat is high tea at Elsamere Field Study Centre, which boasts a small museum dedicated to its former owner Joy Adamson of Born Free fame, and lovely lakeshore gardens frequented by black-and-white colobus monkeys. Named after the twin basaltic cliffs that guard its northern entrance, Hell’s Gate National Park protects a dramatic volcanic landscape of ancient lava plugs, sulphuric water vents and obsidian outcrops. It is also one of the last places in East Africa where one can walk or bicycle unguided through herds of plains wildlife. Buffalo, giraffe, zebra, wildebeest, gazelle and eland are resident, and elephant, lion and cheetah pass through occasionally. The Green Crater Lake Sanctuary is a private reserve centred on the hyper-alkaline Lake Songasoi, which owes its verdant cast to a dense concentration of Spirulina algae. Nestled in a forested volcanic crater, the scenic lake often attracts large flocks of flamingo. Guided game walks or horseback excursions come with a good chance of spotting black-and-white Colobus monkey, buffalo and various antelope. 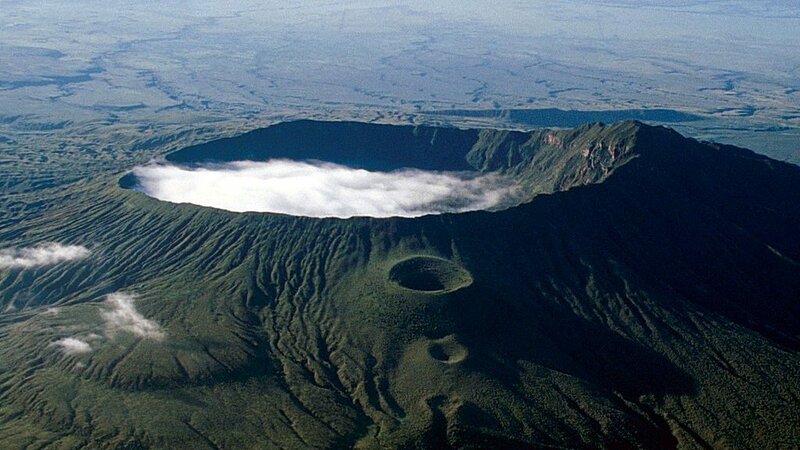 Dominating the skyline south of Naivasha, 2,776m-high Mount Longonot is a distinctive ragged-edged volcano that last erupted in the 1860s and is now protected in an eponymous national park. The crater rim offers fine views in all directions and the steep hike from the base takes around 90 minutes in either direction. It is also possible to the circumnavigate the full rim over 3-4 hours. Situated entirely within the Delamere Estate, alkaline Lake Elmenteita has a primeval setting amongst a range of evocatively-shaped volcanic plugs. Superb views over the lake, whose shallows are frequently tinged pink by flamingos, can be obtained from a conspicuous hilltop cairn 2 km west of the main Naivasha-Nakuru Road. 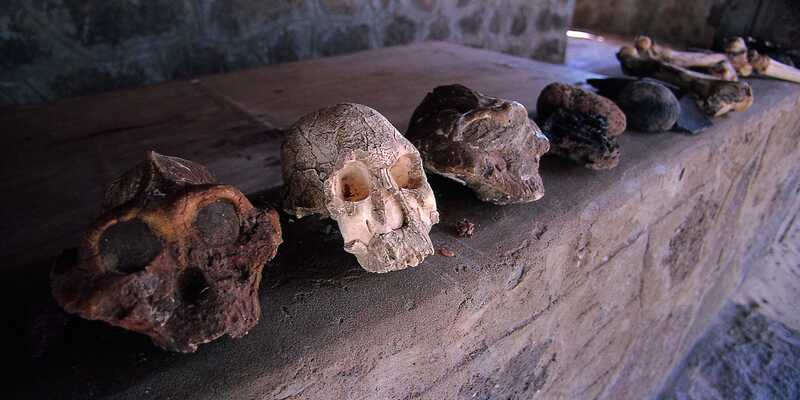 Excavated by Louis Leakey over 1928-31, Kariandusi Prehistoric Site was once a factory for the production of Stone Age tools, which have been unearthed there by the hundreds, made either from local lava rocks or from glassy obsidian sourced at nearby Mount Eburu. An enduringly popular fixture on Kenya’s safari circuit, Lake Nakuru National Park is famed for its concentrations of up to two million flamingos, a phenomenon that Roger Tory Peterson proclaimed to be “the most fabulous bird spectacle in the world”. 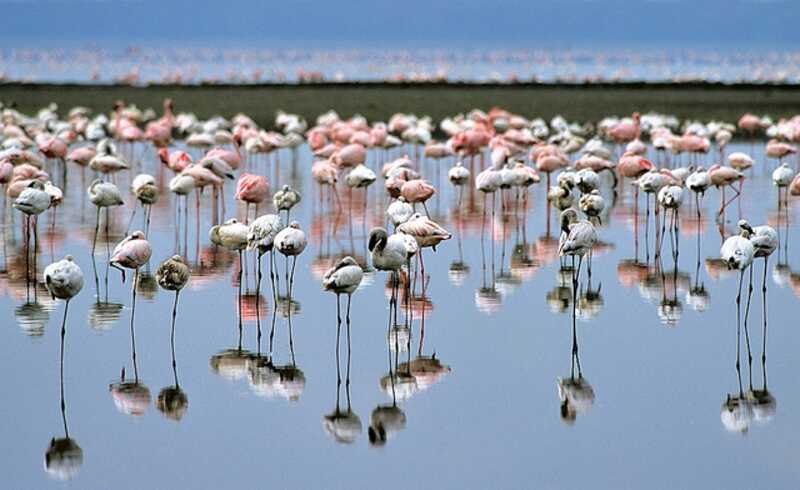 In recent years, the flamingos have more often been amassed at Lake Bogoria, but even without them, Nakuru is a splendid reserve, and an important stronghold for black rhino, white rhino and Rothschild’s giraffe. All the Big Five other than elephant are present too. 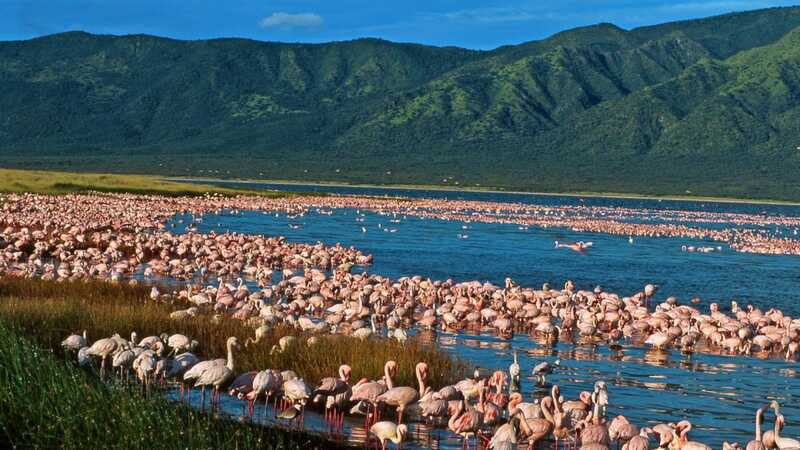 Nestled at the base of the sheer Laikipia Escarpment, Lake Bogoria National Reserve has in recent years replaced Nakuru as the place to see aggregations of hundreds of thousands of flamingos, which feed on the prolific blue-green algae. Other highlights include a scalding trio of primeval sulphuric geysers that empty into the alkaline lake along a network of multihued channels. Large wildlife is scarce in the surrounding overgrazed scrub, but the reserve is one of the last Kenyan strongholds for the greater kudu, which is most active at dusk. Freshwater Lake Baringo, set below the Rift Valley escarpment north of Bogoria, ranks among the top birding destinations in Kenya, with 500-plus species recorded in the immediate vicinity, notably such northern dry-country specials as white-crested turaco as well as Hemprich’s and Jackson’s hornbill. The lakeshore Njemps people specialise in fishing from flimsy balsa boats and a community project arranges boat trips to look for hippo, crocodile, monitors, lizards and aquatic birds. 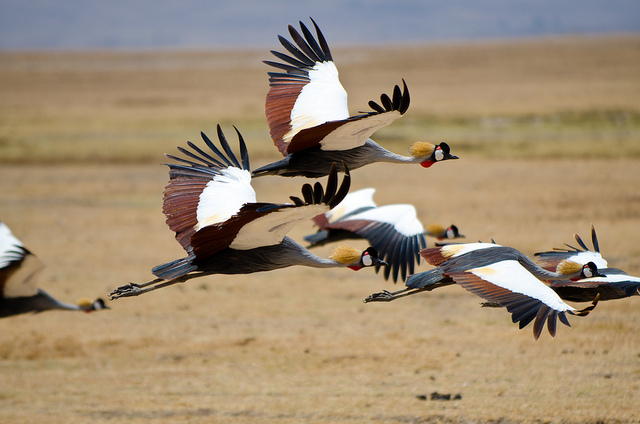 Although domestic charter flights are available to certain sites, the Rift Valley lakes are readily accessible from Nairobi by surfaced roads, and the area is well-suited to self-drive tours or independent travel using public transport. On more extended safaris, it is easy enough to divert to Naivasha en route between Nairobi and the Masai Mara. You could also stop overnight at Naivasha and/or Nakuru to break up the drive between the Masai Mara and more northerly reserves such as the Aberdares and Laikipia. The shore of Lake Naivasha is lined with lodges, hotels and campsites catering to most tastes and budgets. At Lake Nakuru, a couple of upmarket lodges set within the park are supplemented by campsites and a few budget hotels in the neighbouring towns of Nakuru. 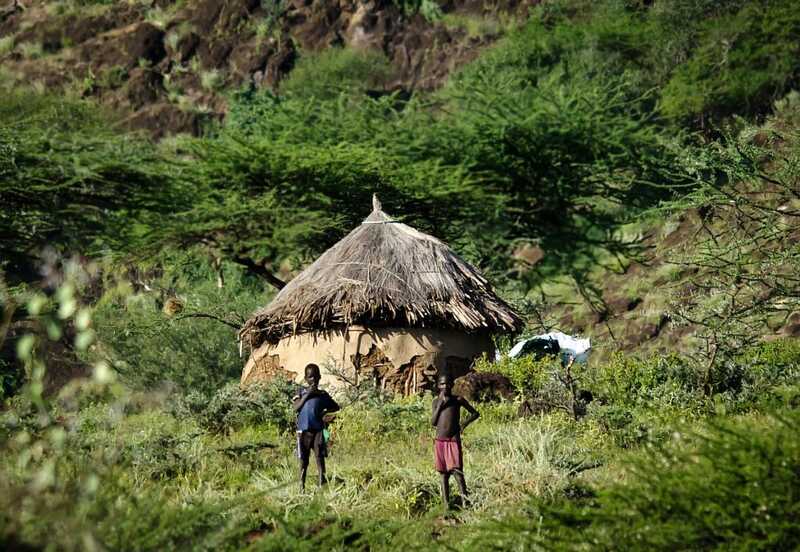 There’s also good accommodation for all budget at Baringo. Options are fewer at Elmenteita and Bogoria.